A fine collection of Pinot Noirs (and a couple Chardonnays) were tasted recently. 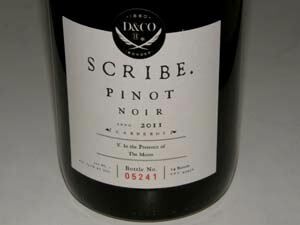 Special mention should be made of Scribe Winery in Sonoma Carneros. 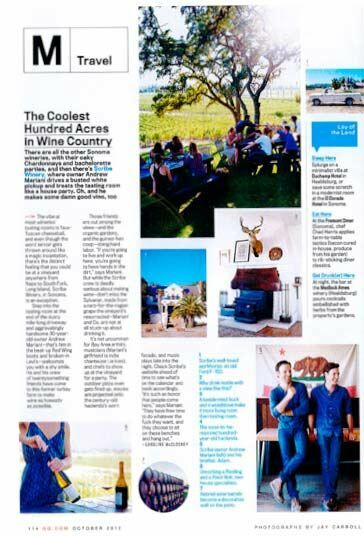 Recently featured in GQ Magazine, which called it “The Coolest Hundred Acres in Wine Country,” it has become amazingly popular among Bay Area food and wine cognoscenti in a relatively short time. The tasting room is outdoors on a knoll overlooking the vineyards with picnic tables strategically scattered about to take advantage of the view. Visitors reserve a table for 90 minutes where they can sit, chill and drink some great wine while receiving personalized but not obtrusive attention. Appointments are fully booked up to a month in advance. The biggest challenge for the owners, Andrew and Adam Mariani, is not selling wine but producing enough wine to sell. Scribe wines are on the wine list at all four San Francisco two-star Michelin restaurants: Atelier Crenn, Benu, COI and Saison, and eight Northern California restaurants that have received one star. Of the two restaurants receiving the highest Michelin rating of three stars, Meadowood pours Scribe Chardonnay. If you visit, please say hi to my son, Dane, who works for Scribe in multiple capacities, while still finding time to manage my PinotFile website on his days off. Visit www.princeofpinot.com/winery/1220/. 12.5% alc., 900 cases, $38. From a nearby vineyard farmed organically by owner who is Scribe’s vineyard manager. 80% Robert Young clone and 20% clone 76. Natural primary fermentation, no malolactic fermentation, slightly extended lees contact, 100% stainless steel (no oak). Light straw color in the glass. · Light straw color in the glass. Very fresh array of aromas that dance in and out including lemon, passion fruit, straw, nuts and vanilla cream. Crisp, clean and bright with flavors of lemon, white peach and a hint of banana brought into focus with uplifting acidity. A touch of minerality adds to the pleasure. A pleasing, food-friendly wine. Very good. 13.1% alc., 350 cases, $42. Sourced from the bayside flatlands of Carneros. Yields 4 tons per acre. Wild yeast fermentation. Aged 5 months in neutral French oak. · Moderately light reddishpurple color in the glass. 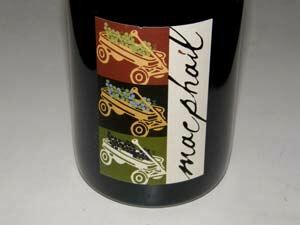 Very enticing aromas of black cherries, black raspberries, Middle Eastern spice, and a hint of tar and smoke. The mid-weight flavors echo the nose, supported by gossamer tannins and good acidity, and showing very gentle oak highlights. Highly enjoyable and easy to drink, the refreshing cherry-driven finish urges you to take another sip. This is Pinot Noir unplugged and offers what many Pinot lovers crave: wonderful, soft, highly approachable fruit flavors linked with a relatively low alcohol percentage. Even better when accompanied by food. Tasted twice. Very good. 14.1% alc., 3,000 cases, $25, screw cap. · Light straw color in the glass. Fresh aromas of lemon, pear, banana peel, vanilla, roasted nuts and sea shells. Slightly creamy on the palate with appealing flavors of lemon pudding, peach skin, and tropical fruits with a slight nuttiness in the background. A solid wine with reasonable vibrancy and a smooth finish. Good. 14.5% alc., 4,000 cases, $35, screw cap. · Moderately dark reddish-purple color in the glass. Scents of darker berries, rhubarb and forest floor lead to flavors of black cherries, blackberries and a sidecar of herbs and oak. Nothing special, but enough richness to satisfy, and styled with soft tannins for easy drinking. Decent. 14.0% alc., pH 3.57, TA 0.65, 345 cases, $39. A loving tribute to the Peys who have three daughters (“trois-filles”). From three sites located less than 8 miles from the Pacific Ocean. Low yielding vines, trademark tiny clusters and berries and high natural acidity. Multiple Dijon clones and heritage selections. 100% de-stemmed, native fermentation initially with Burgundian yeast inoculation subsequently. Aged 14 months in 3-year air-dried French oak cooperage with extensive sur lie stirring. Unfined and unfiltered and aged in bottle for 10 months. · Moderately deep reddish-purple color in the glass. The nose is dominated by aromas of dark red fruits with underlying notes of clay, oak and dark red rose petals. Well-endowed with middleweight flavors of pie filling fruits including raspberries and strawberries backed by mild, dry tannins and a refreshing cut of acidity. The wine is soft and smooth in texture, showing admirable integration of oak, and exhibiting impeccable balance. Picks up intensity and adds a peppery herb and spicy twist to the lengthy finish the following day from a previously opened and re-corked bottle. Would definitely benefit from decanting if you drink now. 13.9% alc., 240 cases, $39. Sourced from three vineyards. 100% de-stemmed, native yeast fermentations, aged 16 months in 33% new French oak barrels. · Moderately light reddish-purple color in the glass. The nose is rather shy and nondescript, offering demure aromas of cherries. Moderately rich essence of dark red cherries and berries with complimentary oak, offering supple tannins, good acidity and a short, but pleasing finish. This wine is refined and balanced, and I would be content to drink it, but it doesn’t emote. Good. 13.45% alc., 240 cases, $50. 100% de-stemmed, native fermentations, aged 16 months in neutral oak. · Moderately light reddish-purple color in the glass. Well-endowed with aromas of black cherries, black raspberries and baking spices. Elegant and charming with soft tannins, offering flavors of dark red Pinot fruits with a hint of spice, finishing with some crisp length. Highly approachable now, it may pick up more nuance over time. A more delicate Savoy in this vintage. I miss a little touch of new oak, but this is done well in its style. Very good. 13.6% alc., TA 0.57, 2,597 cases, $38. Sourced from Sundawg Ridge, Dutton Ranch and Lakeview vineyards in the Green Valley of Russian River Valley. Pommard and Dijon clone 115. Aged sur lie 11 months in 40% new French oak barrels. · Moderately dark reddish-purple color in the glass. An array of aromas rise from the glass including black cherries, rose petals, wood box and a hint of citrus. Medium weight flavors of black cherries, cola and spice with the slightest hint of oak. Definitely Russian River Valley in character but a bit lean and ordinary. Decent. 14.1% alc., pH 3.96, TA 0.60, 5,952 cases, $32. From two 10-year-old blocks of the Sarmento Vineyard each planted to a distinctive clone: 50% 667 and 50% Pommard. Aged 9 months sur lie in 40% new French oak cooperage. · Moderate reddish-purple color in the glass. The nose is heavily oak-driven with a prominent scent of mocha java, and demure aromas of dark stone fruits and floral bouquet. Very fruity and pleasant to drink with flavors of black raspberries, black cherries, grilled mushrooms and black olives with a hint of candied rose. On the lighter side for a Santa Lucia Highlands bottling, with very silky tannins making it very user-friendly. Good. 14.0% alc., TA 0.60, 775 cases, $49. Released fall 2012. Clones 115, 667, 777. 100% de-stemmed, 5-day cold soak, indigenous yeast fermentations, weekly lees stirring for 3 months, aged 11 months in 60% new and 40% once and twice used French oak barrels. Unfined and unfiltered. · Dark reddish-purple color in the glass. Delicate perfume of fresh black cherries with a hint of nutty oak. Delicious core of black cherry and black raspberry flavors that deliver a stunning mid palate impression. Seamless, with mild supportive tannins and a lengthy, fruit-scented finish. I wished for more aromatically from this wine, but this may come in time. Meanwhile, the flamboyant fruit flavors will bring you to your knees. Very good. 13.9% alc., TA 0.57, 275 cases, $49. Released fall 2012. 50% Dijon 115 and 50% Pommard. Sourced from a vineyard located off Roberts Road in the Petaluma Gap. 100% de-stemmed, 5-day cold soak, native fermentations, weekly lees stirring for 3 months, aged 11 months in 50% new and 50% 1 and 2-year-old French oak barrels. · Moderate reddish-purple color in the glass. The aroma of coffee-scented oak dominates the nose with little fruit evident. Perfectly ripe, vivid dark red fruit smothered in oak. Soft and smooth on the palate with gossamer fruit tannins and a refreshing finish. The oak will surely integrate better over time, but I fear this will always be an oaky wine. Decent. 14.9% alc., TA 0.55, 250 cases, $49. Pommard, 115, 667 and 777 clones. 100% de-stemmed, 5-day cold soak, indigenous fermentations, weekly lees stirring for 3 months, aged 11 months in 60% new and 40% 1 and 2-year-old French oak barrels. Unfined and unfiltered. · Moderately light reddish-purple color in the glass. Demure aromas of pie cherries, forest floor, underbrush and nutty oak. Displaying admirable finesse with powerful dark red fruit flavors, this is a classy wine that is really delicious. The tannins are supportive and the oak is well integrated and complimentary. 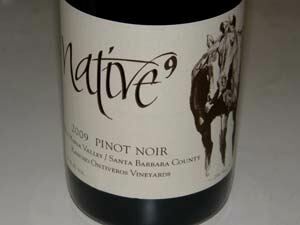 A nicely crafted wine from a very prestigious vineyard that has produced consistently great Pinot Noirs. Very good. 13.6% alc., $60. A 4.5 acre vineyard formerly known as La Boheme in Occidental supplies the fruit. Planted in 2004 to Calera, Pommard and 828. Average yields are less than 2.5 tons per acre. · Medium reddish-purple color in the glass. Exotic nose of wild purple berries, Middle Eastern spices, with a little stem and floral bent. Deep, dark moderately dense dark berry and Hoisin flavor with a savory note of herbs in the background. Definitely earth bound with typical sinewy Sonoma Coast tannins. Good (+). 14.9% alc., 600 cases, $55. Can’t get Paul Lato Wines? Try Hilliard Bruce where Paul is the consulting winemaker. The wines are not identical to Paul’s but his imprint is evident. 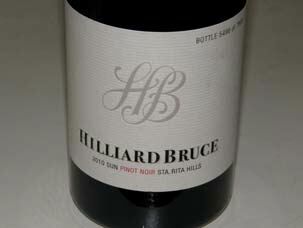 Hilliard Bruce planted 21 acres of Pinot Noir and Chardonnay on 101 acres starting in 2004. The vineyards are Certified Sustainable and are located off highway 246 near Clos Pepe and directly across 246 from Dos Hermanas Vineyard (formerly Ashley’s). Aged in 50% new French oak barrels for 16 months. · This wine is beautifully composed offering enticing aromas of ripe black cherries, dark berries and cardamom spice, and luscious flavors of the same fruits with added notes of plum, cola and vanilla. Moderately rich with tannins that threaten to take over now but tend to mellow over time in the glass. The silky texture is very seductive. This wine is still a bit closed and will benefit from a few more years in the cellar. Very good. 14.0% alc., $NA. Rancho Ontiveros overlooks Rancho Tepusquet, the third land grant the James Ontiveros family settled over 130 years ago. Father Mark and James Ontiveros tend the vines. · Dark reddish-purple color in the glass. Secondary bouquet of underbrush, cinder box, old book, cigar and sherry. Bold, very ripe, sweet dark plum and blackberry flavors losing out to dominant fine-grain tannins. A bit of acid shows up on the slightly tart finish. A well-aged wine that should be drunk now. 14.5% alc., $60. 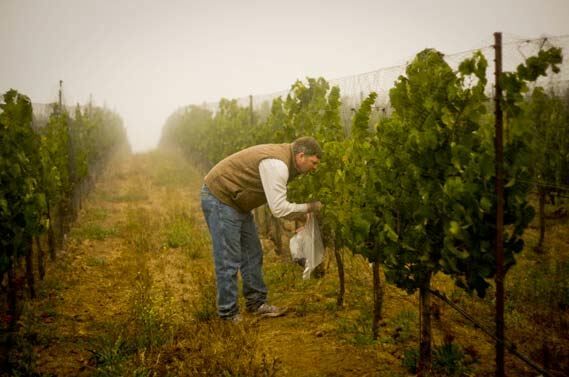 This 8-acre vineyard was hand planted by James Ontiveros and named after the generations that came before him. His plantings were done between 1997 and 2000 (variety of clones and rootstocks). James is the Director of Sales and Marketing for the Miller family properties including Bien Nacido Vineyard. The winemaker is Paul Wilkins. I don’t know the proportion in this wine, but I know James uses a very high percentage of whole cluster. · Moderately light reddish-purple color in the glass. Aromas of dark red berries, spice, herbs and mocha jump out of the glass. Easy going and flat-out delicious, boasting a powerful core of deep red cherry and berry fruit sheathed in healthy, ripe tannins, but retaining admirable finesse. Remarkable staying power on the aromatic finish. This wine makes quite an impression. Approachable now, but should easily last another 7 to 10 years. 14.1% alc., $40. Sourced from three small blocks at Pisoni Vineyards and vinified by Jeff Pisoni. Few wine connoisseurs are aware of the tiny amount of Chardonnay on the Pisoni property that was originally planted in 1982. · Light straw color in the glass. Aromas and flavors of baked pear, crème brûlée, pineapple and lemony citrus. A moderately rich style made with full malolactic barrel fermentation and barrel aging sur lie. Fresh, satisfying and thoroughly user friendly, displaying perfect integration of oak and overall impeccable balance. One of my favorite California Chardonnays and a great value.